It was also important to Christy that her MBA program focused on developing a combination of practical skills and the knowledge needed to drive innovation. “I like that the iMBA degree program at Jefferson is geared toward preparing students for real-world situations, not just hypothetical scenarios. I also liked that the program has a lot of focus on teaching students how to think innovatively, which I think will be incredibly important in the current, rapidly changing marketplace,” she said. 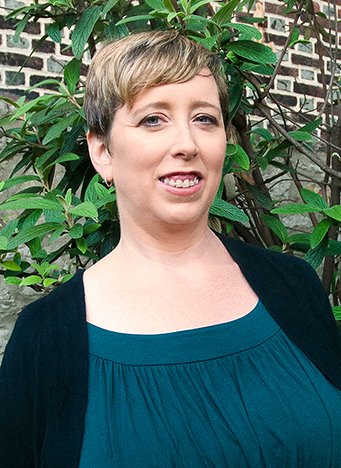 As an undergraduate, Christy studied English. One of the reasons she chose Jefferson Online’s iMBA program is that it offers options tailored to her background outside of the business world, helping her bridge the knowledge gap. “The degree program was also attractive to me because of my non-traditional background. My undergraduate degree is in English, and I had no previous business education (aside from that learned on the job) prior to enrolling in the program. By taking Jefferson’s concentrated ‘foundations’ courses that are especially designed for non-traditional students like me, I was able to get up to speed quickly before entering the iMBA formal program,” she said. Christy has already been able to apply what she’s learning in the iMBA program to her daily work responsibilities. “In the [roughly one] year that I have been in the program, I have already noticed a difference in the way that I view my work. I am now able to understand the rationale behind various strategic initiatives my company has been implementing, which allows me to better explain these initiatives to the staff that I manage. I feel like I communicate more effectively as a manager, and I am better able to think outside the box in order to solve the various problems that inevitably crop up from time to time,” she said. Christy feels that some of the main benefits of Jefferson Online’s iMBA program are the flexibility and accelerated pace. “The program itself is well-designed and flexible, and it is amazing how much you are able to learn in each 8-week module. In addition, the other students in the program come from various backgrounds, and it’s fascinating to see how the concepts you are learning can be applied across so many different types of businesses,” she said. Whether you are looking to advance in your current career like Christy or are interested in developing skills for a new position, Jefferson Online’s iMBA can help you meet your professional goals. With an integrated, project-based curriculum focused on real-world skills, our program develops dynamic problem-solvers and entrepreneurial thinkers who are ready for success. Learn more about this flexible, innovative degree program here.